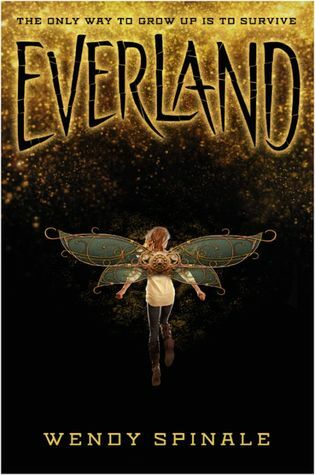 I've made no secret out of the fact that Peter Pan retellings are some of my favorites at the moment. At the end of last year I read Tiger Lily by Jodi Lynn Anderson and back in February I got my hands on Unhooked by Lisa Maxwell. Peter was not a nice guy in the original tale, but these new adaptations have often shined him in a different light, a more compassionate light, and that's quite alright by me. Wendy Spinale's "Peter Pan" is a steampunk(ish) adventure set in a war-tortured, plague-ridden London. German forces have invaded the city and unwittingly released a deadly plague that has killed almost all adults and most of the child population. Captain Hanz Otto Oswald Kretschmer is leading the charge to find the remaining children in hopes of discovering a cure before returning to the German Queen with his tail between his legs. His conquering of London did not quite go as planned. Gwen, along with her sister Joanna and brother Mikey, have become scavengers, surviving in an abandoned buildings and living off whatever food Gwen can find on her nightly trips into the city, trying not to get captured by Hook's Marauders. Then she meets Pete, the brave and loyal leader of the Lost Boys who have built a city of their own underground. When Joanna is taken by the Marauders, Pete agrees to do the impossible, and help Gwen get her back. There's so much else going on. The story alternates between Gwen and Hook. Hook is not as power-driven has he appears on the surface. He really just wants to find the cure and get out of dodge. He is more of a Lost Boy than he would ever admit, wishing he had had the love of his mother and step-father, but instead sent on a fool's errand. Gwen resents having to grow up too quickly, but she does was needs to be done to care for her younger sister and brother. She falls for Pete a little too quickly, and the story progresses at such a quick pace that character development is sacrificed a bit for plot.